Samantha calls this the Sunshine House. 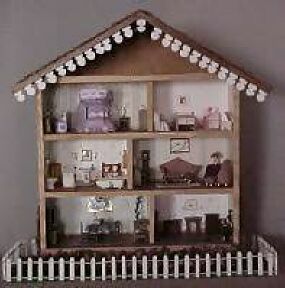 This is my first dollhouse and also the very first miniature project I ever did. Nothing like starting big! 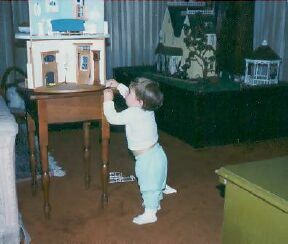 I had wanted a dollhouse for a long time and in 1985 (?) 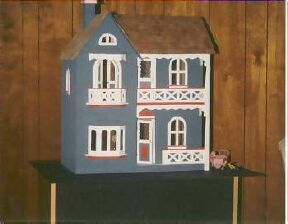 I had shoulder surgery so thought making a dollhouse would be good physical therapy. 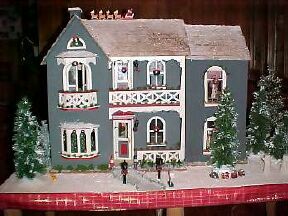 The photo below shows what the "Gray House" looked like before I added a wing and changed it into the Christmas House. It seemed like by the time I got my real house ready for Christmas that I never had time to decorate my miniature houses so I decided to have this one be Christmas year round. (Although Samantha did comment that Christmas was over so we had to take the snow off!) I still haven't finished the wiring. The lights are battery operated. I'm switching to the hard wire type courtesy of HBS half price New Year's sale. Most of the trees are fiber optic and beautiful when lit. Like many miniaturists, I was fast running out of room. I designed this house to fit on a shelf. This was a challenge since each room could be only four inches deep (except for the master bedroom - needed room for the bed). The extra depth of the master bedroom overhangs the deck which worked out ok. Also, I wanted each room to be modular so I could take them to work to share. The rooms are made from foamcore so are very light. Samantha who was about three at the time helped me glue together the large box that the rooms slide into. Such fun! Another space saving idea. Since this one moved to Paradise, California with Samantha, I'll have to make another one day. This was my first attempt at quarter inch scale. 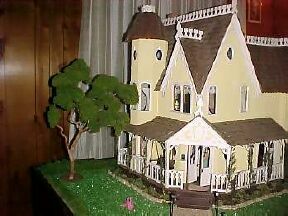 I scratch built the house out of scraps and hand cut the shingles to scale. The roof trim was made from the ends of fancy craft sticks. I found the little picket fence at Michael's Crafts. December, 2000 - finally finished the wiring - no more batteries! Looking back at the experience now, I can really say I've learned a lot over the years. Even though I can look at it now and see all of the things that could have been done better, it still remains my pride and joy and has given me (and Samantha) lots of pleasure.